The villa has a large rounded pool surrounded by a sunbathing terrace with inset palm trees, BBQ and shaded chill out area, lawns and orchard none of which is overlooked. Inside are 3 double rooms (1 en- suite with walk-in shower), & 3 twin rooms, 3 with balconies, all bedrooms have Air Con, plus a linked room. The verandah with its mountain views is accessed from the open plan lounge/diner which has a wood burner for off-season nights, plenty of comfy seating, Sat TV, DVD player and Wii with games. The fully equipped kitchen is freestanding and open-plan with a large dining area. The villa has lots of natural light and neutral decor throughout, with Turkish accents. As well as the ensuite, there are a further two bathrooms, with showers, one on the ground next to a bedroom accessible to disabled guests and one on the first floor. Your price includes all utilities, cleaning, linen, daily pool and garden maintenance, premium welcome baskets and access to our Management Team. They are available 24/7, are English speaking and in resort. We organise our transfers with them and they can help you with information, car hire, trips, jaunts and any issues that may arise throughout your stay. 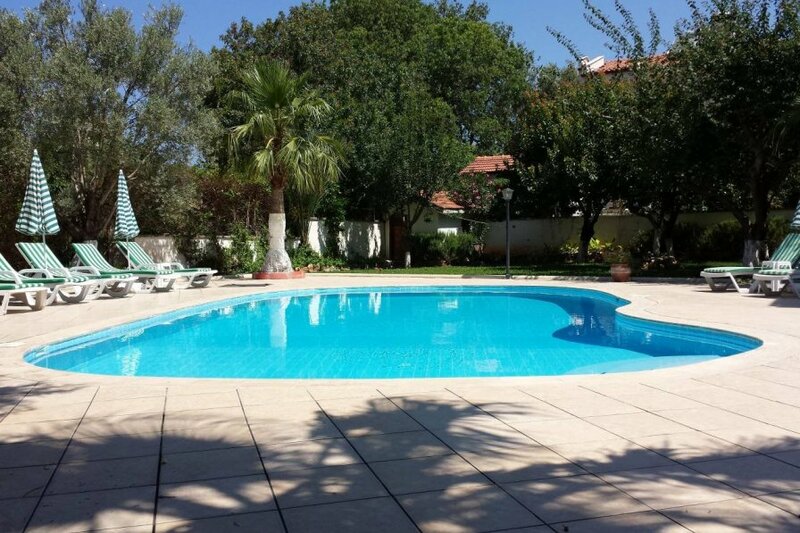 There is a taxi point near the villa or the main road is 200m away with regular Dolmus (minibus) service. Restaurants, bars, shops and hotels are positioned along the main road that leads to the lively resort of Hisaronu and then down the mountain to the Turquoise Sea. Beautiful Horseshoe bay with gentle surf, boats for hire and paragliders landing, cosmopolitan bars and eateries. Street markets, rooftop cocktail bars, chill out music and sunsets. Crystal clear, warm and still, surrounded by wooded hills with beach bars and sand - paradise. Rough Guide voted it into the top 10 best beaches worldwide. Hisaronu has it all restaurants, shops, bars, nightclubs and traditional weekly market. The nights are very long, with bars and clubs open until the last customer leaves! The villa is close enough that you can walk to the fun, but far enough away that you won’t be kept awake by it. Perfect for families or groups of friends. Nearby; Fethiye is an ancient market harbour town, old souk, marina, promenade, cool shops. KayaKoy is a 'ghost' village that is slowly being reclaimed, beautiful and eerie with top notch eateries. Jeep Safaris, Boat Trips, Paragliding, Snorkelling and Scuba Diving, Microlighting, Horse Riding, Camel Treks, Walking, Fishing, Moped and Car Hire and various jaunts to historic Lycian sites such as Pamukalle, Ephessus, Marmaris, Xanthos, Pinara, Patara, Saklikent Gorge and Tlos. There is a playground, friendly bar and fantastic waterpark 2 minutes walk from the villa. Transfers available, Full details are sent in the Arrival Instructions on completion of a booking.